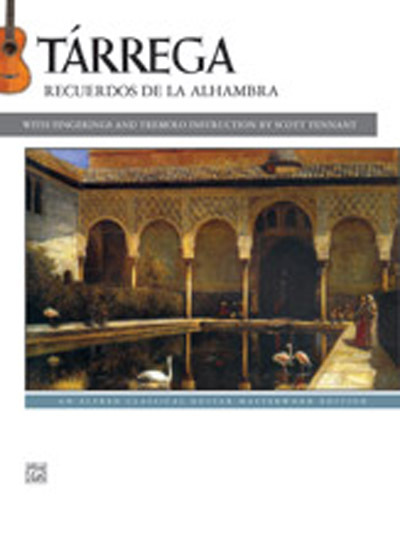 This edition of Tarrega's classic tremolo-based composition "Recuerdos de la Alhambra" includes background information on the composer, detailed tremolo lessons, and thoughtful fingerings from Scott Tennant, one of the world's premier guitar virtuosos. The Alhambra is a fortress in Spain with many fountains, and the tremolo in this piece is inspired by the sound of the water running through these fountains. Tennant talks about his own history as a young student learning this piece and shares the method he ultimately developed for mastering the art of the tremolo, a technique that is elusive for many classical guitarists. He provides a progressive set of exercises designed to take you up to a level of familiarity with, and control of, the right-hand patterns one must master in order to develop a smooth tremolo. You'll find two additional versions of "Recuerdos de la Alhambra" in this edition---one for the right hand alone, and another in block chords so you can focus on mastering the left-hand connections and shifts required for a musical performance. In this one book, you have both one of the crown jewels of the guitar repertoire, and a way to develop the technique needed to play it. This is a must-have edition for all classical guitarists.